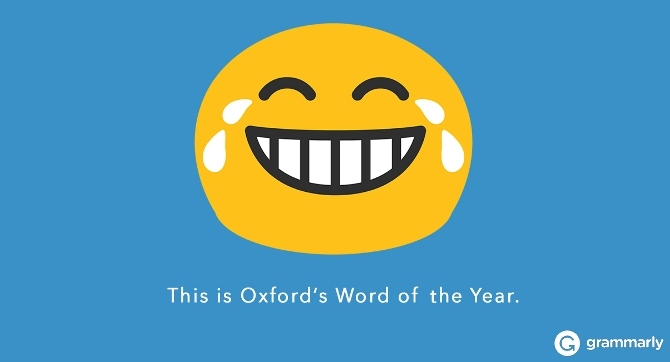 The Oxford Dictionaries word of the year for 2015 is . It’s an emoji. The reaction to this news has varied from (it’s the death of language!) to (it’s a lame publicity stunt). Emojis are not words. That’s something Oxford itself agrees on, defining the word as “a single distinct element of speech or writing.” We don’t speak in emojis or write in emojis, at least not the old pen-in-hand way. But in real-world conversation, we don’t rely solely on words; body language is said to make up 55% of communication . So perhaps the emoji is the digital equivalent, enhancing the tone of our message beyond words. If so, is it possible to distill the huge gamut of complex human emotion into a series of comic faces? And why the “face with tears of joy” emoji? Oxford said it “best reflected the ethos, mood, and preoccupations of 2015.” Is this the same 2015 defined by climate change talks, terrorist attacks, and a migrant crisis? These seem at total odds. However, together with Swiftkey, a mobile tech company, Oxford found was the most frequently used emoji of 2015. Could it be our tears of a collective clown? Or perhaps it is no reflection of our moods at all. Instead, emoji-speak is a self-contained discourse and we tailor our conversations and emotions to fit its limits. And this is the crucial shift that Oxford has acknowledged with their choice. Using images in communication is nothing new. The first sentence in John Berger’s Ways of Seeing proposes that we understand images before words. “Seeing comes before words. The child looks and recognises before it can speak.” So the popularity of emojis in digital conversations is not so surprising. Perhaps it allows us to return to a pre-linguistic form of expression and understanding. This return to the dialogue of images is clear from the rise in photographic platforms like Instagram, Pinterest, and Snapchat. Berger goes on to say that “It is seeing which establishes our place in the world; we explain that world with words, but words can never undo the fact that we are surrounded by it.” It’s always a challenge to explain our world with words. But even a photograph is taken from an angle chosen by the photographer. Emojis are constructed by a certain group of people and used by people in a certain way. They are not as pure and simple a medium as they appear. Emojis are loaded with meaning beyond the sum of their parts. Almost a century ago, Ferdinand de Saussure, a pioneer in the field of linguistics, wrote that language is a system ofsigns, and words are only part of this system. For Saussure and other semioticians (studiers of signs), anything at all that forms meaning is language. Meaning is coded in so much, from the clothes we wear to traffic lights changing color. A word is a string of letters that is assigned a meaning, and this meaning is arbitrary to the word. In English, the word for a canine is dog. In French, it is chien. But both words signify the same object. However, images have a more natural relationship to what the are signifying. A photo of a house reflects the image of the house. In this way, emojis can transcend words and be understood across all cultures. However, as emojis increase in popularity, their meanings become more layered. Roland Barthes, critical theorist, explored these layers of meaning and the idea of connotation. He used the example of a dove. A picture of a dove is the sign, while the bird itself is what is being signified or denoted. We link the image of the dove with its connotation: the concept of peace. This is as arbitrary a relationship as words have with their meanings. In emoji land, new connotations are emerging. For example, the eggplant , has become more than a picture of a vegetable. It is now the phallic emoji. And not to be used in the wrong contexts. The same images are reproduced over and over again, like emoji clichés or speaking through kitsch. Out on an emoji farm called Unicode in California, new crops of emojis are grown and their limits are established. Anyone is able to suggest new emojis to Unicode. Each proposal must include a case for the new creation and is then put to a committee who decides its fate. This well-known phrase was coined in 1964 by communications philosopher Marshall McLuhan. Although the quote is often misunderstood as meaning that the vehicle is everything and the content is irrelevant, McLuhan actually meant something quite different. He used the example of a news story about a crime. The message, he says, is not the story itself, or the delivery, but the sense of fear that evolves from hearing the story. It’s noticing these “messages,” or shifts in culture (the “ground,” as he put it), that is crucial. So perhaps Oxford Dictionaries, in naming an emoji as the word of the year, has noticed the McLuhan message—the shift in our discourse. Acknowledging this shift allows us to monitor and check the effect it may create, good or bad. Once viewed as juvenile and left to the kids, emojis have now been adopted by politicians. In a recent tweet, Hillary Clinton called for people to describe their feelings on student loans in three emojis. Even so, few politicians would use an emoji on a matter of serious public concern. Even Clinton’s emoji attempt received criticism for treating the topic of debt with flippancy. Emojis are light and playful, and can imbue an otherwise serious message with irony or wit. It’s strange that these emojis, which have been around since 1999, have surged in popularity in 2015. This year, we have seen global political upheavals and threats, a huge migrant crisis, and the effects of climate change. But, as in any time of trouble or war, escapism is sought through art and culture. During World War II, musical films surged in popularity; Hollywood produced seventy-five musicals in 1944. So perhaps it’s not surprising that we are adopting this universal discourse in an effort to lighten the mood. The language of emojis allows us a certain tone that we cannot grasp through words or other imagery. And what’s more, in its transcending of cultures, emojis are a unifying language. This digital expression can fuse together cracks in failing traditional systems: a reincarnated Esperanto.